In observance of Memorial Day, Jesseca Wheaton is hosting a three day blog event to honor those who died in military service, especially men and women from our respective cites/states. I chose to write about Cpl. 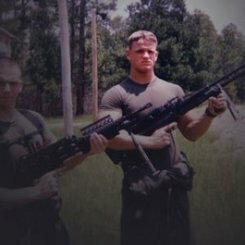 Jason Dunham, a 22 year old Marine who jumped on a grenade to save his comrades. Jason Dunham was born on November 10th, 1981 (the 206th anniversary of the Marine Corps) in Scio, New York, a small town about 80 miles southeast of Buffalo. Jason's siblings looked up to him as a role model. He gave them lessons on confidence and character and was always fun to be around. One thing all his teachers remembered was his smile. His mother, Debra Dunham, learned of one of his acts of kindness after Jason died. He went out of his way to comfort a childhood friend when the other children teased her on the bus. I recently wrote an article for the local newspaper about two veterans, Joseph Leo and Dieter Birkholz, who served on opposite sides during WWII. Here's the article. Enjoy! Joseph Leo (left) and Dieter Birkholz share memories of their service World War II recently at the Eldred (Pa.) World War II Museum. Dieter Birkholz and Joseph Leo were young men fighting on opposite sides during World War II. Birkholz was a German Luftwaffe anti-aircraft crewman, while Leo flew 15 missions as a U.S. Army Air Corps B-17 waist-gunner over Nazi-occupied Europe. Now friends for over 35 years, they recently sat side-by-side at the Eldred (Pa.)WWII Museum to share their stories. Birkholz was born in Szczecin, Germany and was only 6 years old when Adolf Hitler came to power in January 1933. He remembers having a good childhood with his young widowed mother and younger brother. At 10 years old he joined the Jungvolk and, at 14, the Hitler Youth.